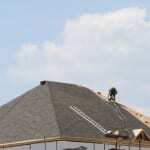 We have a team of skilled roofing technicians who offer roof replacement services in Midland. Home renovations are all the rage right now, as property owners look for ways to maximize value without spending a fortune. Although cosmetic upgrades are typically the focus of many house flippers, what people may not realize is how much value a roof replacement service will add to a property. Whether you’re planning to sell your home in the near future or you want to live there for many more years, replacing the roof is one of the best things you can do to protect your investment and make the building more structurally sound. Real estate buyers might like the look of cosmetic upgrades and renovations on the inside, but they’re far less likely to make an offer when something is wrong with the structure, especially the roof. Roof replacement might seem like a big, costly job, but our experts at Slippery Slope Roofing offer roofing services for a reasonable price. We also work efficiently and only take on one job at a time, which allows us to complete the task faster without sacrificing quality. Before we replace your roof, we’ll assess the condition to make sure replacement is the right way to go. In some cases, roof repair is a more cost-effective solution that will offer a high level of protection and security, especially if your roof isn’t very old. We have a team of skilled roofing technicians who offer roof replacement services in Midland, Ontario. If you’re ready to take the next step and increase your property value as well as improve the protection your roof can provide, contact us to get an estimate on roof replacement.